So Why Buy an Edwards LE-10 Tube Microphone Preamp? 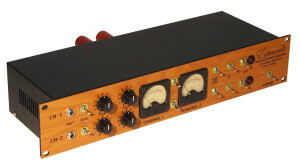 A whole new generation of Microphone Preamps exist on the market today. If you’re considering the purchase of a high end tube microphone preamp first take a serious look at whats under the hood. When we designed the LE-10, The RCA Tube Manual, the bible of tube technology, was consulted right from the start. We looked at the voltages needed for the tubes to work under optimal conditions. We needed around 280 volts DC. So, we designed a power supply that would give us those voltages. Many of today’s Mic Preamps use only a fraction of that voltage, resulting in little or no headroom, poor frequency response and, in general, poor performance. Because of this one small design feature our vacuum tubes operate under optimal conditions providing a smooth, warm killer sound! The LE-10 mic preamp uses premium components from leaders in the industry like Neutrik, Amphenol and Jensen Transformers. In addition we hand selected and matched high quality vacuum tubes to deliver the best tube sound with the most versatility. Quiet potentiometers by Bournes, quiet film type resistors, high quality capacitors and well designed printed circuit boards complete the mic pre ensuring noise free ultra-stable performance. The LE-10 has the features you would expect from a high end preamp including: a 20db pad, direct in instrument jack, a trim and gain control, illuminated VU meters, phantom power, and phase reverse switches. We house all of this is in a beautiful cherry wood laminate 2 space rack chassis. The LE-10 looks classy and sounds even classier! The front panel is laser etched and the lettering will never fade or wear off. The Preamp is made in the USA by hand with Paul Edwards personally checking each unit before it goes out the door. We stand behind our preamp with a 1 year parts and labor warranty backed by Edwards Audio Research. Hear for yourself. The LE-10 Microphone Preamp Sounds Great! Looking at specs sheets tells a small part of the story. This is a preamp you have to hear!